We laugh at the cravings that pregnant women have for certain foods, but sometimes the cravings may be a signal that we are missing some vital nutrients. What you eat matters, and proper nutrition is important for the health of your baby now and in the future. In this article I will share information and tips to help women know how to build a great foundation by eating a balanced whole food diet. Choose locally grown food whenever possible. Eating the freshest food possible means that the food is going to retain more nutrients. Choose organic whole food. Organic produce and animal foods are raised without pesticides, antibiotics and other harmful chemicals. Whole food is typically found in the perimeter of the grocery store or at a local farmer’s market. Shop for food in the produce, meat and dairy departments and then visit the middle aisles to look for seeds, nuts, herbs and spices, olive oil, coconut oil, raw sauerkraut and canned coconut milk. Use unrefined sea salt instead of table salt. Sea salt is essential for maintaining blood volume and protecting against dehydration. Look for Redmond Real Salt, Celtic Salt or Himalayan Salt. Protein provides the amino acids required for building baby’s cells and tissues as well as antibodies and hormones produced during the pregnancy (Bartholomy, 2008). The best, most complete protein is found in animal foods — meat, fish, poultry, dairy and eggs. Protein is also found in nuts, seeds, grains and beans. How much protein? 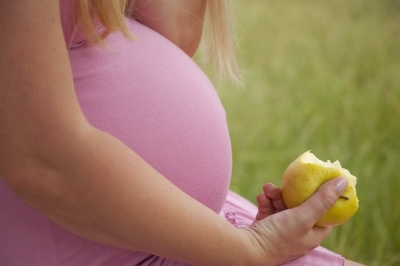 Protein needs double during pregnancy and most women will need 70 – 100 grams per day (Haas, 2006). Our brains are two-thirds fat and having enough natural fat in our diet is critical to proper development and function of the brain. Eating low-fat and fat-free is very harmful to the brain, nerves, hormones and every cell. Our bodies need fat to be able to use trace elements and the fat-soluble vitamins, A, E, D and K. Enjoy organic butter, extra virgin olive oil, unrefined coconut oil or macadamia nut oil and avoid the highly processed vegetable and seed oils on the supermarket shelves. One of the best family of nutrients for you and your developing baby are the essential fatty acids. Omega-3 fatty acids are called essential because our bodies do not make them – we must eat them. Omega-3 fatty acids are prevalent in fish like salmon, sardines, and herring. Eat fish several times a week and supplement with a quality cod liver oil, like Green Pastures fermented cod liver oil. Flax seeds, chia seeds, walnuts and pecans are additional sources of Omega-3 fatty acids. “The Omega-3 fat and its derivative, DHA, (docosahexaenoic acid), is so essential to a child’s development that if a mother and infant are deficient in it, the child’s nervous system and immune system may never fully develop, and it can cause a lifetime of unexplained emotional, learning, and immune system disorders,” writes John Finnegan in his book, The Facts About Fats. The carbohydrates to include in your diet are plant foods that contain fiber, vitamins, minerals and other nutrients. Vegetables are key. Vegetable carbohydrates are a rich source of nutrients and they don’t sabotage your health like refined grains can. Eat a variety of raw, fresh, lightly steamed and stir fried vegetables. Aim for at least one or two servings of vegetables per meal. Fruit, when eaten in the whole form, contains fiber and a variety of nutrients. The tendency might be to overeat fruit and under eat vegetables because we let our sweet tooth pull us in that direction. Even natural sugar found in fruit can be a problem for some people when eaten to excess. Limit whole fruit to about 3 pieces per day, possible fewer pieces if you have blood sugar issues. Now that we have talked about the macronutrients, protein, fat and carbohydrates, let’s touch on a few special vitamins and minerals for pregnancy. Dark green leafy vegetables like chard, spinach and dandelion greens are high in iron and other vitamins and minerals. Red meat and liver. It is best to purchase grass-fed organic meat and liver. Sea Vegetables, nutritional yeast, prunes, raisins and mushrooms. Iron supplements guard against anemia. Elson Haas, MD and author of Staying healthy with Nutrition, recommends a total of 40-80 mg/day (Haas, 2006). I recommend Floradix (gluten-free version) for a well-absorbed form that will not cause constipation. Dr. Haas recommends 800 – 1000 mcg folate daily and notes there are no side effects from supplementing with folic acid (Haas, 2006). Avoid synthetic “Folic Acid” and choose the methylated form, like Super B.
is involved in hundreds of enzymatic reactions in the body. 450 – 1,000 mg is needed for optimum health. Magnesium relaxes blood vessels, is helpful for hypertension, headaches, swollen ankles and hands and preeclampsia (Dean, 2007). Magnesium supplementation during pregnancy has been shown to prevent premature births and one study showed significant improvement in fetal outcomes with appropriate levels of maternal magnesium (Almonte, 1999). One of the most absorbable forms of magnesium is magnesium glycinate (avoid magnesium oxide). Now is not the time to worry about weight gain. The average weight gain during pregnancy is around 25 pounds, but 25 – 35 pounds is not a problem. Remember that the mother truly is eating for two and during pregnancy the priority for nutrient use is first to the baby, at any cost. Not eating plenty of the required nutrients means that the fetus pulls nutrients from the mother’s body. The calorie need increases to 2,400 – 2,800 per day during pregnancy and even more calories are needed during the last trimester (Haas, 2006). The nutrition recommendations made earlier are important to continue throughout the pregnancy but there are a few additional recommendations for each trimester. is a critical time in fetal development as the spinal cord, organs, bones, cartilage and skin are first formed. The placenta which grows throughout the pregnancy is the organ that passes nutrients and oxygen from the mother to the baby. Ground breaking research shows that the placenta is actively involved in making serotonin for the fetal forebrain. This only happens when the mother is eating protein from which the baby gets the essential amino acid tryptophan needed to make serotonin. Because serotonin is important for mood, brain, cardiac and pancreas development, this research highlights the importance of proper nutrition for the development of a healthy placenta and healthy fetus. “Developmental programming of the fetal brain can set the stage for adult-onset health impacts including heart disease, diabetes and mental illness,” remarked researcher Pat Levitt, Ph.D (Bonnin, et al., 2011). Keep in mind that during the first trimester the fetus is very sensitive to toxins and chemicals in the environment. Avoid any medication that your doctor has not approved and steer clear of toxic household chemicals. during the first trimester focus on eating whole foods and eliminating processed foods and fatty foods which tax the liver. Folic acid helps stimulate the appetite during this time when food is less appealing. Dr. Elson Haas recommends Vitamin B6 and says other vitamins that may be helpful include B12, C and E. Herbal teas like raspberry leaf, peppermint, and ginger root are also helpful (Haas, 2006). Remember that folic acid is very important in the first few weeks to prevent neural tube defects, so load up on the dark green leafy vegetables. Calcium needs are around 1,000 mg per day. Vitamin C and bioflavonoids are taken in a ratio of 3:1 and are needed by the circulatory system. Start with 1,000 mg of Vitamin C and about 300 mg of bioflavonoids in the first month of the pregnancy, increasing slowly to add about 1,000 mg Vitamin C each month. as highlighted above, but increase protein slowly each month. For example, if the new level of protein needed is 70 – 100 grams per day, in the first trimester try to eat 70 – 80 grams per day. Eat at least three meals and a snack or two, including animal protein when possible. It will be helpful to have a chart on hand to show how much protein each food contains. For example if you eat 1/2 cup cottage cheese, 2 eggs, a hamburger patty and a chicken breast in one day, you will have consumed about 85 grams of protein. Even if the woman is able to eat fish, it is wise to take 1 Tbs of cod liver oil, if tolerated, or DHA from algae. brings rapid growth as the limbs continue to grow and the baby forms a fat layer that protects the spinal column and neck and helps keep body temperature more even. At the end of this period, the lungs will develop more fully. Calcium and protein needs increase with each passing week. Calcium needs are about 1200 mg per day now, while protein needs are around 80-90 grams per day. Continue increasing Vitamin C and bioflavonoids 1,000 mg each month to be about 4,000 – 6,000 mg of Vitamin C and 1,200 mg – 2,000 mg bioflavonoids during this period. Again, eat fish regularly and take 1 Tbs cod liver oil (Carlson, Nordic Naturals). is a period of rapid growth and the baby will be pushing on the mother’s internal organs making it difficult to eat large meals. Instead eat small frequent meals to aid digestion. Continue eating fish and other animal protein to support the rapid development of the baby. During this trimester aim for about 90 – 100 grams of protein per day. The average caloric needs increase during the last three months to an average of 2600 calories per day. Continue increasing Vitamin C and bioflavonoids 1,000 mg each month to be about 7,000 – 10,000 mg of Vitamin C and 2,000 mg – 3,000 mg bioflavonoids during this period. Keeping up with Vitamin C and bioflavonoids will help with the pesky hemorrhoids common during the third trimester, support the veins and capillaries, and help prevent miscarriages. Vitamin E, 400 – 600 IU is another nutrient that helps prevent miscarriage and protects against oxidative damage of the essential fatty acids (Bartholomy, 2008). Drink filtered water. Caffeine, alcohol and soft drinks are best avoided. The beverage of choice is filtered water. Drink half your body weight in ounces of water. For example, a person weighing 150 pounds needs to drink 75 ounces of water each day. For more information of filtering water, please visit my website, http://www.getbetterwellness.com. Exercise is important of a number of reasons. Exercise will help prevent constipation, varicose veins and belly fat while preparing the body to be limber and handle the many changes that will happen over the pregnancy. Try stretching, walking, yoga, swimming, bicycling, and hiking. Impact activities like jumping and horseback riding are not recommended (Haas, 2006). Stress reduction would be ideal, but sometimes learning how to manage stress is more realistic. Now is the time to enjoy peaceful activities like a massage, walking, reading, meditation, breathing and relaxing baths. Become a champion sleeper, aiming to get 7 – 9 hours of restful sleep each night. Detoxification means reducing exposure to anything that might be harmful to mother and baby. This can include caffeine, alcohol, nicotine, household chemicals, hair treatments, and poor air quality. We highlighted the importance of eating a whole food diet earlier. Refined foods are best avoided and typically come in packages, boxes and cans. Poor quality, highly refined ingredients, including sugar, artificial ingredients, MSG, refined salt, dyes, preservatives and hydrogenated oils (trans fats) are common in the Standard American Diet. Eating a whole food diet will help to avoid artificial ingredients commonly found in processed foods while providing a wide variety of nutrients. Now is the time to evaluate what is in your kitchen cabinets and refrigerator. Stock your shelves with healthy whole food and embark on this miraculous journey prepared to feed yourself and your growing baby the best food possible. It may seem overwhelming at first, but as you incorporate more and more of these recommendations you will find that your taste buds change and that you naturally crave healthy food and enjoy exploring new foods. Almonte, R.A. (1999). Gestational magnesium deficiency is deleterious to fetal outcome. Biol Neonate, 76, 26-32. Bartholomy, P. (2008). Nutritional Guidelines. Lecture presented for the Hawthorn University MHNE 608 Healthy Life Cycles Module [Transcript]. Dean, C. (2007). The Magnesium Miracle. New York, Random House. Finnegan, J. (1995). The Facts About Fats. Berkley, CA, Celestial Arts Publishing. Haas, E. M. (2006). Staying healthy with nutrition. New York, Random House.